A referee focuses on a play during a JC football game versus Loyola Blakefield on Friday, Sept. 8. Every call referees make is judged by players, coaches and fans alike. The time runs down to 14 seconds, and the score is tied 14-14. As the Severn School quarterback attempts to throw the ball to his receiver in the end zone, senior Danny Schall jumps up and intercepts the pass. The JC team begins to celebrate, as the game will now go into overtime and they have a chance at beating the number one team in the MIAA B Conference. Suddenly, one of the referees blows his whistle and signals a touchdown, which sealed the game for Severn. 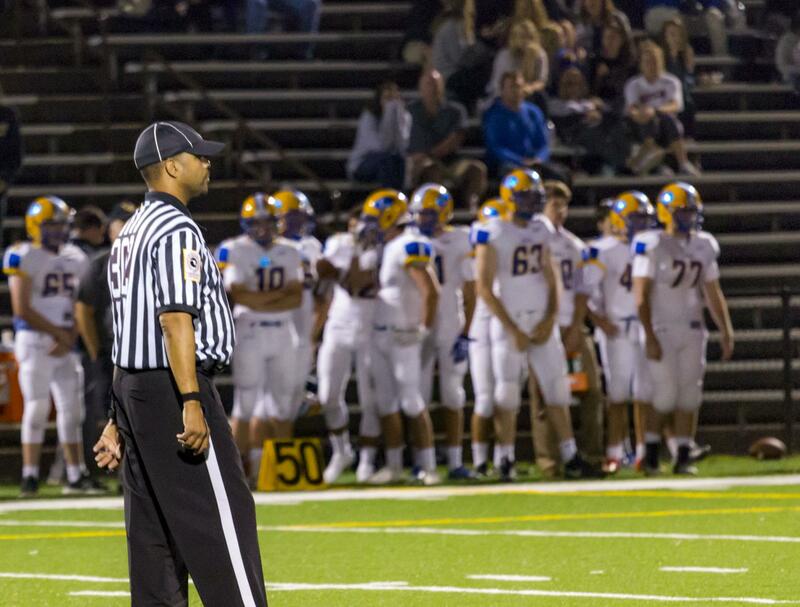 According to senior football captain Cody Copinger, the referee’s awful call shocked his coaches, teammates, the other referee, and even the opposing team. “One of the refs called that Danny intercepted it, while the other ref from the other sideline yelled that Severn had it. Yet the kid from Severn was crying into his hands on the ground … My coach said to me, ‘I’ve been coaching for 25 years and I’ve never seen a call that terrible,’” Copinger said. This controversial call ultimately cost the football team their chance at advancing to the playoffs, but they are not the only students that have had an experience where the referee’s call determined the game. Senior basketball player Myah Savage has also found referees to be inconsistent during basketball games. “One time, a ref got in my way while I was dribbling the ball. He said I ran into him and then gave the ball to the other team,” Savage said. Some students, like junior lacrosse player Michaela Forchion, think referees often make calls that are biased. “I think if a ref likes a certain team more, he’ll give more calls to them,” Forchion said. Junior Sydni Collins agreed that refs can be ineffective and she thinks they often make mistakes. “I think half the time their calls are a guess, so they can definitely be wrong,” Collins said. Although some students have had bad experiences with referees in their games, senior field hockey player Grace Hollin appreciates the role referees play in sporting events. “I think we should be supportive of the refs and their decisions. They can be biased, but in order to keep the peace we should listen to what they say,” Hollin said. However, Hollin agrees that referees sometimes make bad calls, specifically during her field hockey games. “I’ve had times when they called it wrong on another team when a goal goes in and they say there’s no goal, [although] there actually was a goal,” Hollin said. Students like Forchion believe that most referees aren’t qualified. “Most refs don’t know what they’re doing,” Forchion said. However, Hollin believes all referees are qualified because of her sister’s experiences as a referee for soccer games. “My sister went to a two-weekend long training, they have to go through a lot,” Hollin said. Madison Dailey is a Community Editor for The Patriot and jcpatriot.com. The fans chant behind him. The parents yell beside him. The players and coaches focus on him. Senior Francesco Buontempo becomes the center of scrutiny every time he puts on his black-and-white striped shirt. As a soccer referee, the outcome of the game rests in his hands, and no matter what he chooses, someone won’t agree. Buontempo agrees that refs do have their shortcomings, they are not infallible. Refs do miss penalties and they do make the wrong calls, but they are willing to admit it. “Every ref is different, but on average, I’d say around two out of 10 calls are wrong,” Buontempo said. However, refs must stand with their original call. It would only cause more controversy if they changed their calls. “If there’s ever any doubt in a call I make or don’t make, there’s nothing I can do about it because the game moves so fluidly. In a game, there’s no instant replay. Once a ref makes his decision, [he or she] has to stick to it, or else it looks really bad on their part,” Buontempo said. Magner, like many refs, has had to make calls under pressure that have had large impacts on the game. “I was in Connecticut for a night game … between two undefeated teams … [There was a] one-on-one with the goalkeeper … The coaches and home team tried to tell me [the goal] was shot outside the circle. I knew what I had seen, but I wasn’t sure, and my partner couldn’t help me. She wasn’t where she was supposed to be. To this day, I don’t know if I was right. I tied the game under a controversial call,” Magner said. Magner believes players and coaches are wasting time when they try to argue calls in games. In several sports, such as rugby, arguing a call is an ejectable offense. “Players should play the game. That’s their job. Players play, coaches coach, and refs ref,” Magner said. Buontempo, however, does not think that the players are the main ones arguing calls. Regardless of who is arguing, Buontempo does not let it distract him from the game. “I feel as though the parents put the most pressure on you as a referee. You have to judge the game fairly, and if you call something wrong or late, it can potentially win the game for the other team,” Buontempo said. Many focus on the validity of a refs call, while a referee’s focus is on the players’ safety, not on their bias towards a team. “It’s all about keeping the game safe. [Referees] have no particular interests. Personally, I just see two colors. It’s red and gold or white and blue,” Magner said. In the end, referees are just trying to do their best. “Officials are not trying to make the players’ lives miserable. As much as it may seem like that. We think all the calls over in our heads. We want to make the right call,” Magner said. Matthew Foulk is a Sports Editor for The Patriot and jcpatriot.com.